It is way too cold in Atlanta, lol. I can't wait for it to warm up! Anywho, I wanted to share with you some pictures I took of a shoot I did a few weeks ago. The client is an up and coming female rapper named Jagged. I listened to her CD during the shoot and she's amazing! She can rap and sing and reminds me of a mix of Queen Latifah, Jasmine Sullivan and Eve. Get it girl! Jagged was worning with renowned photographer Annette Brown. Annette has shot everyone from Prince, Jay Z, Jeezy, Allan Iverson...all the big hitters. I was really excited to work with her and definitely learned a few things in the process. Jagged wanted two looks: a smokey one for a little black dress, and a bright one for a b-girl look she was rocking. Here are her before and afters. Click on the picture to expand. A quick run down of each look: I used MUFE orange corrector to conceal undereye circles, Cinema Secrets Cream foundation, graftobian powder, definitive sculpting powder to contour. I extended her eyebrows using spiked brow pencil and embark e/s. Smokey Look: On her eyes she's wearing Sharkshin Shadestick, Black Tied e/s and Vanilla e/s. On her lips she's wearing chesnut lipliner, siss lipstick, and chai lipglass. 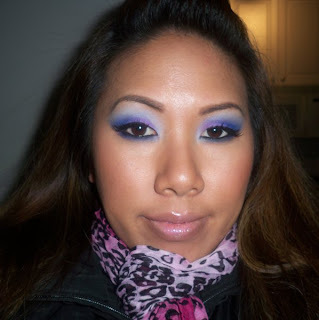 Bright Look: On her eyes she's wearing a bunch of colors from the Yaby Best of Both Worlds palette. On her lips she's wearing Mahogany lipliner, violetta lipstick, and the hot pink dazzleglass. Here's a pic of the makeup I wore to the shoot. Stay tuned for my blogger garage sale! How fabulous, r2! Love the B&A, but even more: adore your eye makeup! Both looks are gorgeous! I love how you concealed her dark undereye circles so well. I'll have to look into that MUFE corrector you used. And of course, your eye makeup looks great! Looking forward to your garage sale! :) Thanks for sharing. Usually I'm a neutral gal, but I love the bright look on her. Gorgeous! And can you get any cuter!?!?! 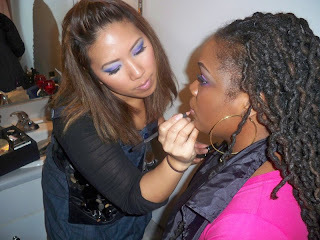 Your makeup looks great- that includes what you did to yourself and for your client. You are the bomb dot com! seriously Ren, how did you get so fab? the hot pink lip with the more subtle eye is my fave. Ren, I'm loving all the looks espcially the smokey I thik its because I love and wear the lip combo all the time and you look is super fab as well. Question, Does the MUFE correctors blend well or are hard to blend? WOW @ the before & after!!! u did wonders for her skin and undereye circles...great job!!!!!!!!!!! And ur makeup is gorgeous!!!!! Tutorial coming???? lol. Loved your makeup look during the shoot. I'm hoping you'll post what you used. beautiful!! i loveee your work! Thanks for always sharing it with us! great job as always Ren. now did i read SALE??? awsome! U SHOULD GIVE ME A MAKEOVER HAHA WHERE DO U RESIDE? She looks great! I love the smokey look the best, she looks so classy. Good job! I might have to invest in the MUFE concealer palette. great job and your makeup looks great!